I can't believe it's December already! You know what that means, though. . .new Taylored Expressions goodies! 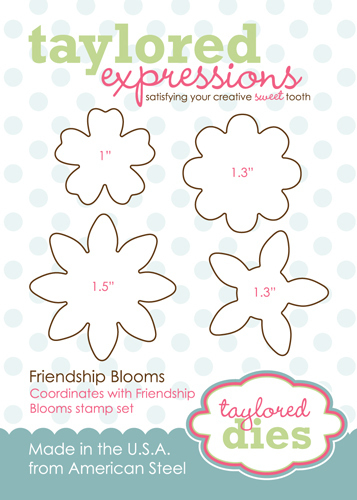 Today the Baker's Dozen is featuring Friendship Blooms and some new coordinating dies! Friendship Blooms is a beautiful all-occasion flower set illustrated by Nancy McKinney as part of the Whimsical Wishes Collection. 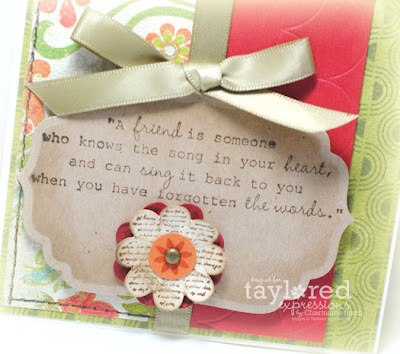 It has perfect sentiments for those everyday "friend" cards. For my first card, I used my favorite sentiment in the set along with some So Sophie Savvy papers from My Mind's Eye. I stamped the sentiment and cut the panel using the Labels 4 Nestabilities. The flower was created using the new Friendship Blooms Dies and coordinating stamps from the set. Did you happen to notice something else on the card? YEP! There is some embossing! 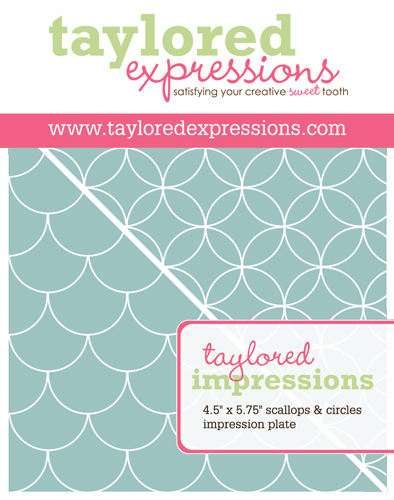 And YEP, Taylored Expressions is introducing the first in the Taylored Impressions line. . .the Scallops & Circles Impressions Plate! 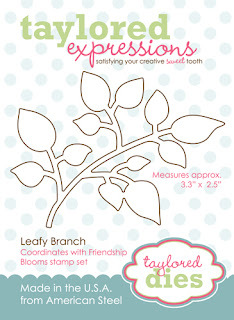 You know how much I love to emboss on my cards, so I am VERY excited about this new product! 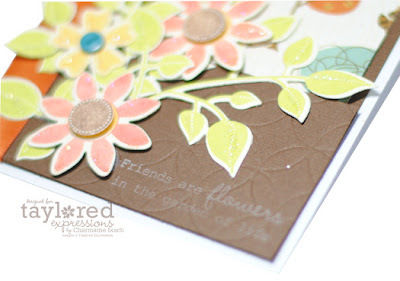 For my second card, I used more of the Friendship Blooms Dies to create this floral bunch! I used the October Key Ingredients Kit for this card. 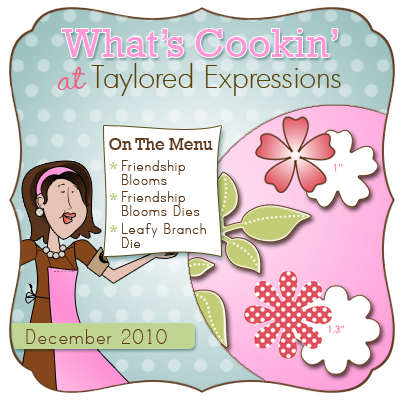 The flowers are cut out using the Friendship Blooms Die and the branches cut using the Leafy Branch Die. In this picture, you can better see the flip side of the Scallops & Circles Impression Plate. I just love both sides of this plate! And here's a closeup of the flowers and branches. You can read more about the impression plates and dies HERE! Everything you've seen today will be available for purchase on Friday, December 3rd at 8am Pacific! 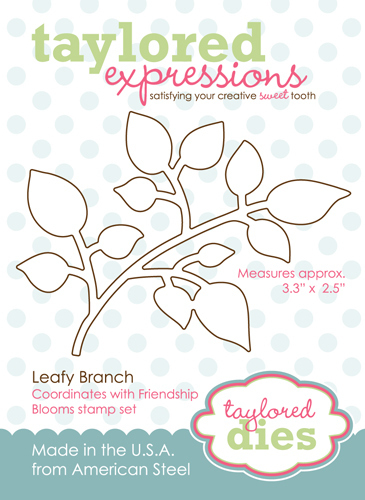 Be sure to visit the rest of the Baker's Dozen to see more of these new products! Stop back again tomorrow for more sneak peeks! Thanks for stopping by! These are GORGEOUS Charmaine! LOVE the colors and layouts!! 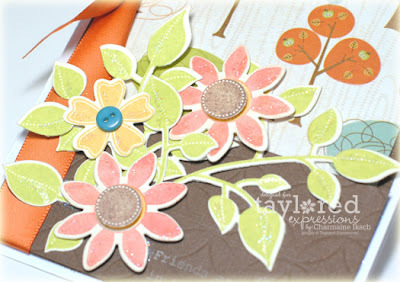 The cluster of flowers on the 2nd card is AWESOME!!! beautiful cards, I absolutely adore that first one and the embossing folder is gorgeous. OOOH, I'm loving the white ink on the chocolate cardstock! Just gorgeous! These are gorgeous!!! 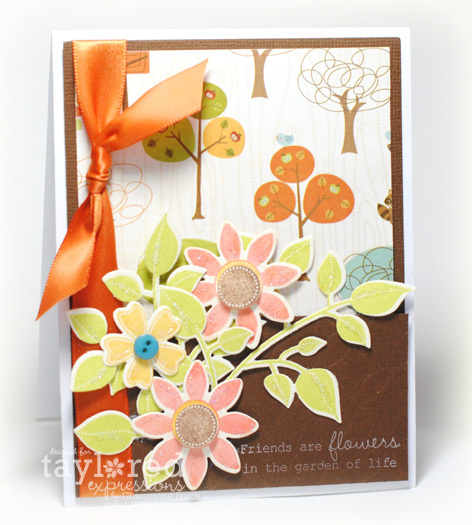 I LOVE the cluster of flowers and leaves on the second card!!! I'm a SAHM of my four little "Oodabugs" Savannah, 14, Arwen, 12, Isaac, 10, and Isabelle, 9. 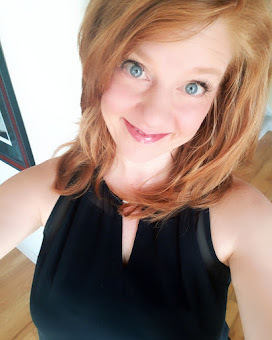 I've spent my life as a musical theater performer, which is how I met my husband. We met while performing in a show together, though I haven't done much performing since having children. I do keep active in the field through choreographing, teaching dance and singing locally from time to time. As much as I miss the traveling performer's life, there's nothing quite like the performances I enjoy daily from my darling children. A Stamping We Will Go. . .
Quacking Creations by Angie Z. All content within this blog, including design work, text, & photographs are ©Charmaine Ikach. They may not be copied for submission to contests, magazines etc. They are shared for personal/non-commercial use & inspiration only. Thank you! 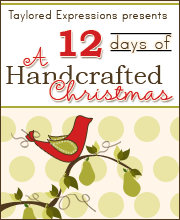 Blog design elements use products from Kristina Proffitt, Crystal Wilkerson and Kaye Winiecki.